"SCHENECTADY, N.Y., Nov. -- Declared to be the largest in physical size ever built, the armature frame and core for the first of the huge hydro-electric generators, being built by General Electric for Russia's famous Dnieprostroi Dam, have been completed in the company's Generator Division here. Shipment of the first complete generating unit, weighing more than 2,250,000 pounds, will be made next April, International General Electric officials said today. The new generators, which will replace those destroyed during the war, will have a 15 per cent greater output than the waterwheel-driven generators built by G-E in 1931 for the same Soviet plant. Each of the new units will be rated 90,000 kilo-volt-amperes, as compared with the 77,500 kv-a of the original generators, which were the largest ever built for this type of service before the completion of Boulder Dam. 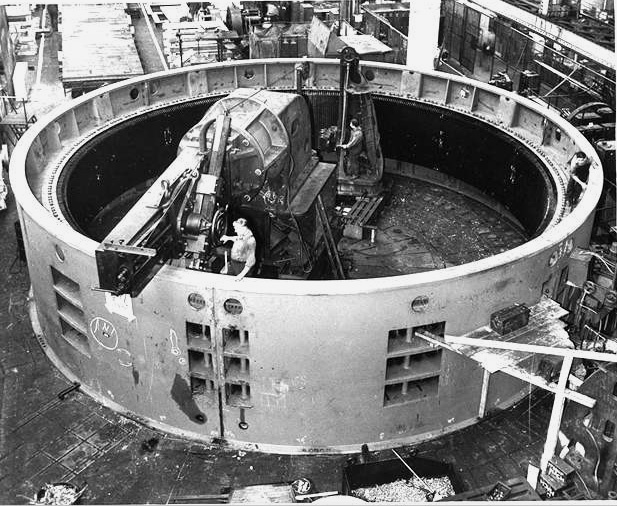 (The Boulder Dam generators, six of which were built by General Electric, are rated 82,500 kv-a.) With a frame diameter of 42 feet, 5 inches, the new generators will be the largest in physical size ever built, according to G-E engineers, and if set on their side they would be taller than a three-story building. Shipment of two succeeding units are scheduled for May and August, 1946."